Radial Load – A load applied normal to the bearing bore axis and parallel to the shank axis. Axial Load – A load applied along the bearing bore axis. That static load required to produce a specific permanent set in the bearing structure. It will vary for a given size as a function of configuration. It may also be PIN limited as a function of body restraints as in the case of rod ends bearings. That load that can be applied to a bearing without fracturing the ball, race, or rod end eye. The ultimate load rating is usually, but not always 1.5 times the limit load. That load that can be applied to a bearing to produce a specified permanent set in the bearing structure. 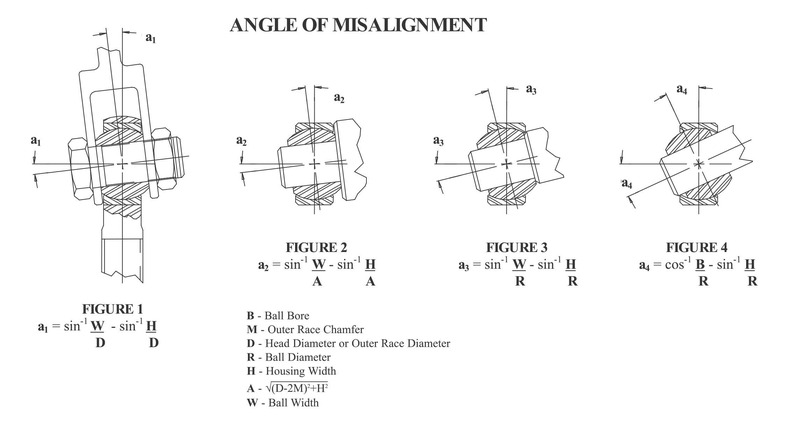 That load that can be applied to a bearing without separating the ball from the race. The ultimate load rating is usually, but not always 1.5 times the limit load.